Reinforced bituminous membranes, also know as roofing felt, area a tried and tested method of providing reliable, quality waterproofing. These membranes have evolved with the times and modern options include polymer modified bitumen technology to provide the perfect combination of low temperature flexibility and high temperature stability. Reinforced bituminous membranes are typically combined in two or three layers to offer long-lasting weatherproof protection. 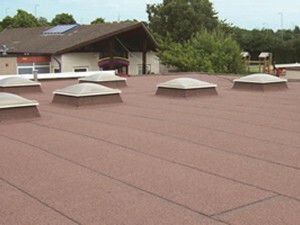 They can also be combined with high performance thermal insulation to meet a variety of warm roof and inverted roof specifications. There are several techniques for applying felt – depending on the materials used, and client requirements. Pour and roll systems involve the felt membranes being rolled into hot bitumen, whilst torch-on roofing involves using professional torches to melt the bitumen on the back of the membrane and bond it to the substrate. There are also cold methods of installing reinforced bituminous membranes, such as through the use of mechanical fixings or self-adhesive technology. Contact Us today for a free, no-obligation roof survey and specification report!